Continuing with the theme of their star performer and mare Stopshoppingmaria, team Repole and Pletcher will send this daughter of Awesome Again out as a maiden seeking her first win and a place on the Kentucky Oaks leaderboard against two in here who have already earned points on the Kentucky Oaks trail. Has a race at all three NYRA tracks showing improvement in each start should relish the added distance. Ended 2018 splitting the field at Laurel in her first try vs. stakes caliber company at Laurel. Winner of two sprints at Parx before that and will try to carry her speed around two turns in a race that’s ripe for an upset. Interesting to note that there are three who will travel from Maryland out of that aforementioned Laurel stakes and this one beat the other two despite stumbling at the start. Interesting, if she can rate. Has a race at the distance when second LTO in the G2 Demoiselle here last December. One of two with points (4) and a chance for more. She was nearly $27 to the $Dollar in the Demoiselle earning her highest BSF (70). Broke maiden before that at Parx and was third to Getting Warmer (the “interesting” one to her inside) three back. All that said, the Dem seems pretty weak from this vantage point. Started career in claiming ranks at Keeneland for Dixiana Farms and Al Stall who dropped her to $30K and said take her if you want her — which happened. The good news for her new connections is she won that race stretching out to a mile at CD. Sent out twice since by new handler and has shown mild improvement in Beyers. Adds blinkers for this and has more promise than the other two she’ll face here from her last two starts. Plenty to consider at a HUGE price. Added blinkers to win last at Laurel over runner to her inside. That was over the slop which she seems to favor since breaking her maiden three back at Parx in the mud. Trainer is not known for stakes talent. Was the beaten favorite ($2.00) last time out at Laurel after scoring maiden win by 11 two-back at Parx. Finished as the runner-up that day over longshot Floss Dancer. Has been bet down in each of her four career starts and has shown improvement the longer she goes. Kinda thinking that the Gin Talking stakes at Laurel was a key race. One of three, as previously mentioned, exiting that race and all have attracted the attention of some top jocks for this one. Wore blinkers in all four career starts but they come off for this as they try to get two-turns for the first time. Trainer is 0 for 31 in stakes races this year and this is a tall-order for sure. As the favorite over the other returnee from the Demoiselle who was two lengths better than she was you might think that it’s a two-horse race between them. They employed a front-running strategy off an impressive maiden victory at Belmont going two-turns and she got understandably tired. 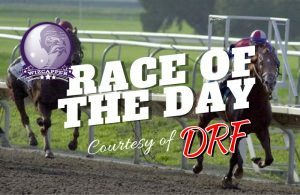 But the fact is that she finished a couple of lengths behind Afleet Destiny ($26.75) who was able to close into a very slow pace at today’s distance. Experience helps but the presence of Miss Marilyn won’t. And though Lezcano takes the call on this one over Marilyn, the risk to reward is too great. Deep closer will need plenty of help upfront. Exits the Gin Talking with a chance to improve with regular rider Pimentel back in the saddle. Seems like the perfect distance to return off her front-running maiden score in her second start. Lezcano opts for the favorite. But Alvarado (1 for 2 teaming with Gargan at Aqu). This won’t be an easy task to get over from the 11 hole but that’s their only chance. And the fact that Pletcher sees fit to send out his maiden Always Shopping (2nd to this one LTO) makes this one the value play.